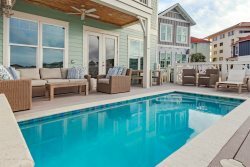 Frangista Beach is an upscale community located in Miramar Beach between Destin and Scenic highway 30A. Located directly off Scenic Gulf Drive, grants you easy access to the area’s best attractions and calls for reams of return travelers. You are close to Seascape and Sandestin Village, a Premium Outlet Mall, and a variety of Golf Courses. Just a short golf cart ride to four different restaurants and bars including Surf Hut, Pompano Joes, Crab Trap, and Captain Dave’s. The sugar white sand beach is just across the street and coastal aesthetic continues throughout every home in the neighborhood enhancing Florida’s tropical feel. There are also multiple beach accesses and a community pool just add to the list of reasons that you want to rent a home in Frangista Beach. This is a very popular wedding destination being it is made up of mostly large homes, great for receptions. To top it off there is a blanketed permit for the neighborhood, so you will not need to obtain a permit for your beach wedding. One summer in Frangista means a lifelong of memories. While these are 3 separate sister communities, they all have one thing in common, LUXURY. Within these exclusive addresses you will find some of the area’s most extraordinary homes. These high-end vacation rental homes offer the complete package. The grounds are made up of brick paved roads and pristine lush landscaping. Nestled around a magnificent stretch of beach, Destiny homes offer an idyllic refuge, all tucked away in quiet, guard-gated communities. Outside of the neighborhood and all of its amenities, there is still no much to do here. The Destin Commons are just a short drive and holds some of the area’s best shopping and casual dining. It is also only a 5-minute drive to over 50 restaurants for your dining pleasure. The Crab Trap offers Gulf - to - Table dishes, fabulous drinks, and mind-blowing views. For a luxury vacation experience, stay at Destiny by the Sea. This Gulf front community is defined primarily by an 8 mile stretch of Scenic Hwy 98, this popular vacation area is known for its family friendly vacation atmosphere. A variety of neighborhoods have evolved in the last thirty years with an ever changing inventory of spectacular beach homes. The spectrum includes condos, townhomes and beautiful gated communities. Small souvenir shops, local catch fish market, family eateries, seafood restaurants and much more, line Scenic Hwy 98. You are also close to Destin Commons and Silver Shells Premier outlet mall, which offer name brand shopping.